Every day I gain a better appreciation of the challenges an author faces as he or she begins to pull together a book. In particular, I’m coming to appreciate how guidebook authors gather a huge quantity of information and sift it together to create a useful guide. Many pieces of information will need to come together for my upcoming book, The Way of St. Francis, due to Cicerone Press at the end of this year. The first is identification of the route itself. Last year I walked from Assisi to Rome with friends and I loved every step. It was great to see sites related to St. Francis of Assisi, and of course it’s alway fun to walk with fellow pilgrims Sebastian, Jacqueline and Andreas. Beyond our walk form Assisi to Rome, though, as you can see on the map to the left there’s more to the St. Francis walk in Umbria. From Umbria’s perspective the goal is clear — Assisi. The tourist department of Umbria has selected two very specific tracks to the hometown of St. Francis. From the north– starting in Tuscany actually, at Della Verna, a walker can proceed south to Assisi. Walkers can also trek from Rieti to Assisi, approaching it from the south. It makes sense that the Umbria tourist office would focus on walks that stay primarily in Umbria, with Assisi at its heart. St. Francis’ home town attracts over four million tourists each year, after all. Even with this clear, central track there are choices to be made before I begin my book. In the “northern” route to Assisi the map shows an option. One can either walk to Perugia on the way to Assisi, or straight from Valfabbrica to Assisi, bypassing the capital of Umbria and the many historic and culinary sites in the ancient city, known now as the “Chocolate Capital of Italy” (it’s also a sister city of Seattle!). Choosing to take this option is not a big obstacle, but one choice among many. I’ll walk both routes and make a final decision about including the Perugia option this summer. A second choice is what to do with the southern loop, which is a circular route through “The Holy Valley” of Rieti, an area filled with important and interesting St. Francis sites. The challenge of a loop through the Holy Valley is obvious — anyone who walks through to Rome only has the choice of one or the other side of the loop. So there’s another minor dilemma to solve. Last year my friends and I walked through Poggio Bustone, the east side of the loop, and weren’t disappointed. It’s a lovely town and important to St. Francis pilgrims. The bigger challenge actually is how to connect this central, Umbrian itinerary to Florence in Tuscany on the northwest and Rome in Lazio on the south west. 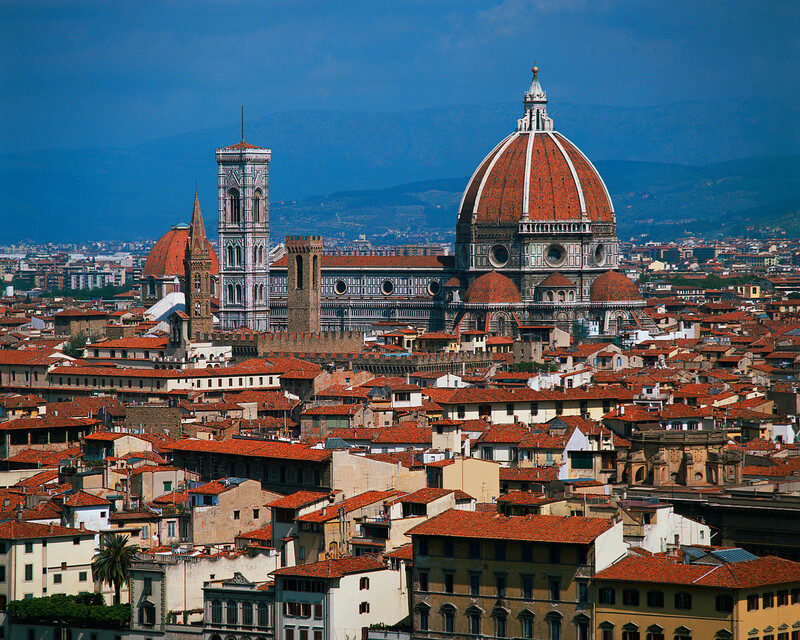 To me it makes great sense to start in Florence, a city rich in examples of Renaissance art and architecture. Also, it’s much easier to get to Florence than to the tiny and remote sanctuary of Della Verna in eastern Tuscany where Umbria’s itinerary begins. And it makes sense to end in Rome, which is one of the major pilgrim destinations of the world. Many Santiago de Compostela pilgrims feel disappointment when they arrive in Santiago, a mid-sized town with only a day or two of fairly minor sites to explore. Rome, in comparison, is nothing short of spectacular. 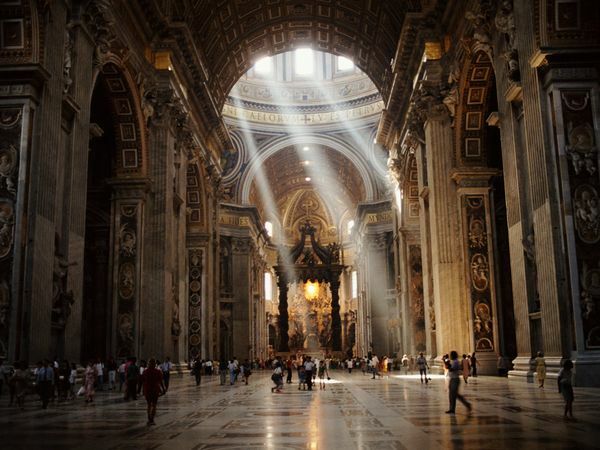 For religious pilgrims there are too many saints’ relics to see in a brief visit, not to mention absorbing the Vatican City and sites of Ancient Rome. So I’m following the lead of a recent German language guidebook and will include the entire Florence to Assisi to Rome walk in my upcoming tome. This creates a 30-day pilgrimage from, through and to three of the most wonderful cities in the world. With this choice the itinerary is almost complete. To connect the northern Umbrian sites to Florence we can fortunately rely on the fabulous hiking trail known as the Grande Escursione Appenninica (GEA), which is one of the major Italian mountain trails, covering part of the distance between Florence down to the northernmost St. Francis sites in the Umbrian itinerary. Sadly, there’s not a clearly marked trail from Florence to the first walking stage and the German guidebook puts pilgrims on a short train ride for the first day. When I arrive in Italy I’ll start looking for a good walking route that connects Florence to the little town of Camaldoli for connection to the GEA path. I may have my Austrian friend, Jacqueline, along for a few days to help with that effort. It’s about six days on foot from Florence to Della Verna. Connecting to the route to Rome has its own challenge. 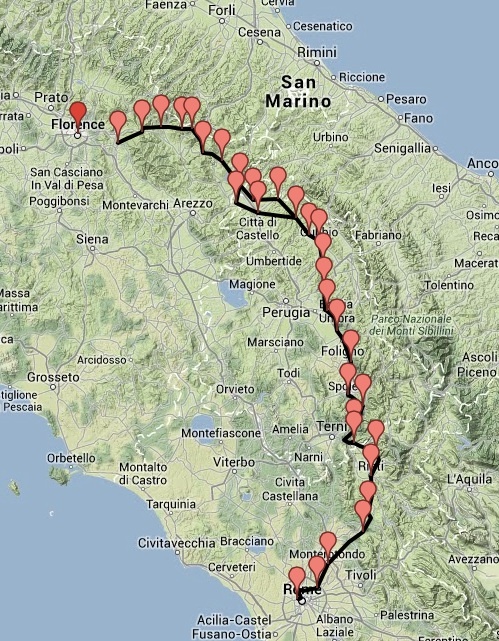 I’ll need to decide what to do with the “loop” — get to Rieti through Greccio or through Poggio Bustone? Though I enjoyed Poggio last year, going that way deletes two important sites from the itinerary (Greccio and Fonte Colombo). I’ll check those two out this summer, too, to see if it’s worthwhile to travel that way somehow. In addition, there’s one day on the Lazio portion without a good overnight stop, so this summer I’ll scout out an overnight at Farfa Abbey instead of going through Ponticelli as the Lazio itinerary suggests. This adds a day, but potentially gives an interesting and inexpensive overnight just three nights out of Rome. 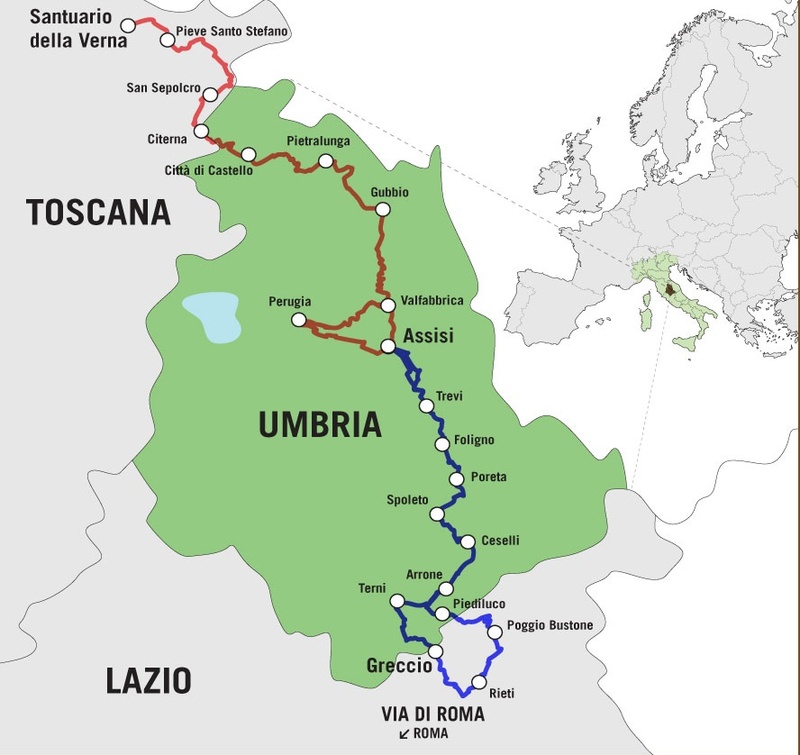 To confirm my choices I’ve already made contact with the tourist offices in Umbria and Lazio, both of which are very interested in spreading the news about these walking paths. The joy of planning this guidebook is knowing that pilgrims who choose this route have ahead of them a memorable and beautiful pilgrimage. To me this route should be of particular interest to experienced pilgrims who’ve already walked the Camino de Santiago and are looking for a new and challenging walk. The Way of St. Francis has some clear highlights — Florence, Assisi and Rome — that in my opinion surpass the wonders of the Camino de Santiago. It has some disadvantages, too. The route is “young” and the infrastructure is “almost” there. This makes it something like the Camino de Santiago must’ve been in the 1980’s before the height of its reemergence today, when over 250,000 pilgrims walk it each year. Exclusive of the relatively primitive infrastructure this route has something that makes it very special. A shining light along every step is the memory of St. Francis of Assisi. Even 800 years later his name brings a smile to the faces of local Italians, and his simple words of love and faith and unity with creation are satisfying words for our hungry souls. I’ve already begun an online study of accommodations on the various routes and have a master list of hotels, hostels, restaurants and cultural sites to visit. On May 21 I’ll fly to Rome, head to Perugia for a month of language classes, and walk this new/old route and its various options twice, carefully noting the best paths, accommodations, food sources and notable sites to visit. Tens of thousands of words, thirty-five maps and 150 photos later I’ll be ready to send The Way of St. Francis to Cicerone Press for publication. I hope it will be a good resource for pilgrims who seek a walk of spirit and adventure and joy.